Project Office automation system (oas) aims at creating an application which will automate the processes in college office. Using this it is possible to keep a database of college information like information about the students studying in various courses, employee information in various departments, staff and non staff details etc. Transaction involving fee and salary is also stored. Fees receipts are generated for students. Reports are maintained for future usage. Search engine is used to search required information. The purpose of this project is to automate the office work. The current system in the office is a manual system which includes paper document. In such a system its very difficult to keep track of all the records. 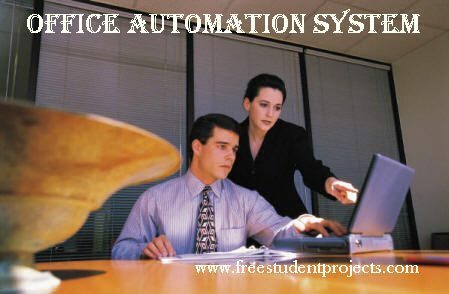 Our project aims at creating an application which will automate the processes in a college office. The software requires the support of the following software for the database and other requirements. VB.NET feature of the Microsoft Visual Studio 2008 for the front end.